The first entry in the Seashells and Sunflowers Argentine Recipe Contest comes from Daniel Tunnard of Buenos Aires, Argentina. Daniel originally hails from Sheffield, England, and he's the author of a blog and forthcoming book entitled Colectivaizeishon, which chronicles his quest to ride all the buses in Buenos Aires. "The inspiration [for this dish] was the Cervatillo II café in Barrio Norte (Ayacucho, between Sante Fe and Arenales) where I used to go for lunch in my first four years in Buenos Aires when I worked at the William Blake Institute, which is now the Apple Store (boo!). It was there that I learnt about minutas, the culinary staples of Buenos Aires. This is my estofado de carne, one of my (ahem) signature dishes, which I cook the same way as beef curry, without the spices. This recipe is all about slow cooking." I decided to make Daniel's estofado de carne for a family lunch. 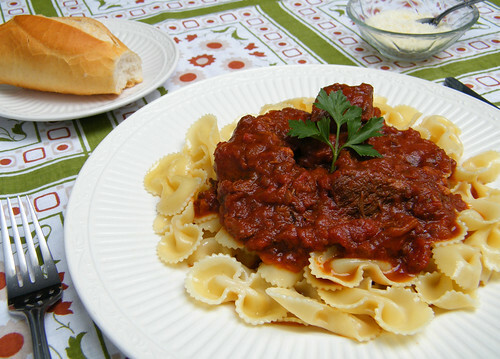 After three hours of cooking, the tomato sauce had taken on a deep, hearty flavor, and the chunks of beef were practically falling apart. I prepared the sauce a day in advance of the get-together, which allowed it to develop even more flavor. I served the estofado over a bed of bowtie pasta with some grated parmesan cheese to sprinkle on top. My husband's family praised the meal, and everyone commented on the tenderness of the beef. Daniel's recipe yielded gratifying results, and I liked that I didn't have to babysit the food. The sauce slowly bubbled away for three hours in the kitchen, and I only popped in every half hour or so to check on it and give it a stir. I don't own a slow cooker, but I imagine this dish would make for a perfect crock-pot recipe. As a final note, if you're preparing this dish here in Argentina, Daniel recommends that you use a cut of beef such as paleta, tortuguita, or rosbif. I opted for paleta, which comes from the shoulder/chuck region of the cow. In a clay pot or Dutch oven, sauté the onion in a few tablespoons of oil over medium heat for 10 minutes, until soft and translucent [Note: I added a pinch of salt to the onion]. Add the whole tomatoes [break them up with your hand], tomato purée, red wine, garlic, oregano, paprika, salt and pepper, and bring the sauce to the boil. Reduce the heat to low, and add the beef. Cover the pot with a tight-fitting lid, and simmer the sauce for 2 to 3 hours or until you can cut the beef with a spoon. Remove from the heat, and let the estofado stand for 10 minutes. 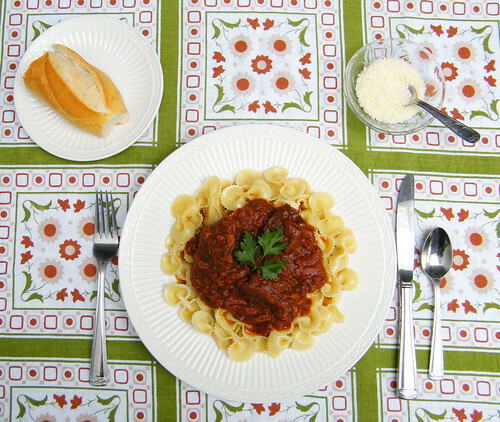 Serve with your favorite pasta and a lengthy siesta.